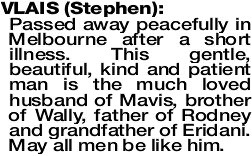 VLAIS STEPHEN Passed away peacefully in Melbourne after a short illness. This gentle, beautiful, kind and patient man is the much loved husband of Mavis, brother of Wally, father of Rodney and grandfather of Eridani. May all men be like him.